If you’re going abroad for business the last thing you want to do is accidentally do something to offend your business colleagues. With some help from Cyborlink, I’ve outlined some basic French business etiquette for you to follow when doing business in France. I’ve also included an infographic on business etiquette from WD Storage which outlines the do’s and dont’s of international business etiquette and conduct in seven countries including: France, South Africa, Argentina, China, Germany, UK, and Italy. Study up so you can make a great impression. Due to its large geographic area, regional differences and large number of immigrants, France is a diverse country. Despite France’s ethnic and cultural diversity, the French attitude towards foreigners can vary widely but in general, the French are NOT very tolerant of foreigners. For example, if you are a Muslim women who wears a full head covering veil, you may have issues conducting business in France since the wearing of such a veil in public is banned by law whether you are French or not. The official reason for the banishment of the full head covering is security. Here are some other tips to help you manoeuvre French business culture etiquette from how to dress and act to communicating and gift giving in business situations. The French are very conscientious of their appearance. Both men and women dress relatively conservative. Here are a few tips to help you blend in and not call unneeded attention to your attire. Women should keep it tasteful and elegant: Women should avoid bright or gaudy colours and anything glitzy such as flashy jewellery. Good shoes are a must! Men should keep it solid and dark: Men should invest in well-tailored clothing. Patterned fabrics and dark colours are most acceptable. Keep your tie and jacket on: French businessmen do not loosen their ties or take off their jackets in the office.. The last thing you want to do is unknowingly come off as rude or vulgar without even knowing it. here are some basic French business etiquette rules on how to behave at work in France. It’s ok to be a little late: Punctuality is treated very casually in France. You should always shake hands when meeting someone, as well as when leaving: French handshakes are not as firm as in the United States. The French handshake is brief, and is accompanied by a short span of eye contact. Knock and wait before entering a room: The French have a great respect for privacy. Knock and wait before entering into a room. Additionally, do not “drop in” unannounced. Always give notice before your arrival. Power lunches are accepted: Business can be conducted during any meal, but lunch is best. Don’t drink hard liquor or smoke between courses: The French believe this permeates the taste buds, compromising the taste of the meal. It is however very accepted to smoke after a meal. Giving a gift to business associates is not common practice in France so giving one in France is usually left to the foreigner’s discretion: If you would like to express appreciation to a French business contact, you may be better off hosting a special event or diner than to give a business gift. If you can’t host a special even than here are some basic tips to follow. Don’t be vulgar: Do not offer gifts with your company logo on them. It’s considered vulgar in France. Forget the business card: French business etiquette dictates that you do not include your business card with a gift. Don’t send it to their house: Never send a gift for a French colleague to his or her home unless it is related to a social event. Send them a new years card: Instead of a gift, consider sending a card during the New years holiday thanking your business partners for the previous year’s business and wishing them a prosperous year to come. Your card and sentiment will be much appreciated. You can send the card during the whole month of January but not later. You probably already know that French is the official language in France and that the French have a great appreciation for the art of conversation. So if you don’t speak French or speak very little French, you should know that many (not all) French people in business do speak some English. Here are some general guidelines on how to communicate with French collegues and business people. Do apologize: If you don’t speak French, it is very important that you DO apologize for your inability to speak French. Interrupting is accepted: The French often complain that North Americans lecture rather than converse so don’t be shocked when you see French people interrupting one another. The French frequently interrupt each other because the argument is seen as a form of entertainment. Don’t talk like a loud American: Americans tend to talk at a louder level than French people and are known to offend everyone in a restaurant, meeting, or on the street with their loud voices and loud laughter. So please be sensitive to the volume of your voice. Eye contact: Eye contact is frequent and intense, and can often be intimidating to North Americans. Make sure you keep eye contact during handshakes and while clinking glasses and making toasts. 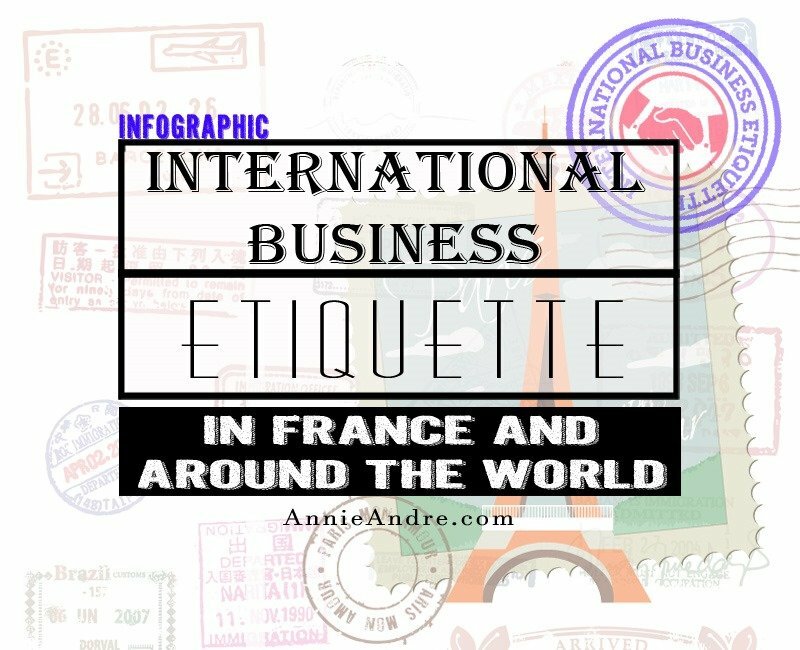 Related to international business etiquette is 7 strange table manners in France and around the world.